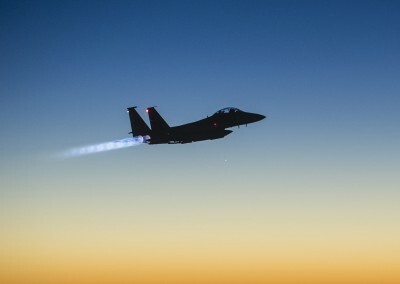 Following the announcement by the Saudi Defense Ministry on Saturday February 14th that the kingdom intended to commit both air and ground forces to the fight against ISIS in Syria, the first four Royal Saudi Airforce F-15S strike fighters arrived at Incirlik air base on Friday February 26th. These jets were immediately proceeded by approximately thirty officers and men and supporting equipment aboard two C-130 transports. It is obvious that Saudi Arabia is sending air forces and possibly ground forces not to combat ISIS and Al- Nusrah Front, having funded them for years, but to ensure that the Syrian government is not able to regain sovereignty of the entirety of the nation. Saudi Arabia has one of the most modern and well-equipped air forces in the region and has invested heavily in this military tool for over two decades and fields an impressive inventory of strike aircraft. The Saudi air force uses a mix of both U.S. and European aircraft, from the venerable F-15C and Tornado, to the relatively new Typhoon. The F-15Cs and Tornados have all recently been modernized and 48 units of the Typhoon have been delivered to the Kingdom from Britain. The F-15S is the Saudi version of the F-15E Strike Eagle strike fighter. It is planned to upgrade all of these units to the latest F-15SA standard over the next few years. The Saudi Air Force has ordered a total of 72 Typhoon T-2 and T3A variants from BAE of the UK. Although this is a modern fighter with strike capabilities, it is rather unproven in combat compared to the F-15s and Tornados historically operated by the Saudis. Saudi aircraft will most likely only operate from Incirlik airbase, along with U.S. and other NATO air forces. This air base has the infrastructure and logistics in place to handle the aircraft of various NATO types. The base is also close to the proposed area of operations (Northern Syria) and is guarded by modern air defenses. Any Saudi force would most likely only go into battle with the backing of a U.S. or NATO mandate, and the employment of U.S. and NATO aircraft in preliminary strikes. It remains to be seen if the United States and NATO will decide to support Turkey and Saudi Arabia in such an escalation of hostilities. Saudi Arabia’s threat of direct military intervention in Syria also signals the failure of their war by proxy. Their armed gangs of Islamic zealots and terrorists have largely collapsed as a viable threat on the battlefield and face a certain defeat. A failure in Syria along with a stalemate in Yemen may prove to be one failure too many for a Saudi monarchy that is suffering from internal division amongst itself and the hundreds of clans whose loyalty ensures their legitimacy. It is very clear that any air campaign engaged upon by Turkey and Saudi Arabia alone will be met with a swift and effective Russian response with both ground and naval-based air defenses as well as the most modern and capable air superiority fighters in the region. Russia has made it extremely clear, in diplomatic yet unambiguous terms that it will not allow any outside forces to invade Syria to topple the government and secure their own aims in violation of Syrian sovereignty. Additionally, Russia has international law on its side in any dispute. It is carrying out military operations within Syria at the request of the legitimate government of that nation. While the assets of the RSAF are modern and capable, they do not represent a technological or combat experience advantage over the forces that Russia can bring to bear in response. Russian air force and air defense forces based in Syria alone present a strong deterrent to any outside power seeking to violate the airspace of Syria without the expressed permission of the Syrian government. It is understood that any direct military confrontation between Saudi Arabia and Russia will further complicate and expand a costly regional conflict into a global one. The arrival of the first Saudi combat aircraft immediately prior to the start of the U.S.-Russia brokered ceasefire sends a clear message that neither Saudi Arabia nor Turkey desire a cessation of hostilities any time soon.